I know it’s only December 3, but I already feel so behind in getting our Christmas card ready this year. We’re still tinkering with it (I’m trying not to panic that I haven’t even placed the order for it yet! ), but in thinking of what to do this year, we looked at what we had done in the past. I always have a few extra cards leftover each Christmas, and I’ve been keeping them together with the Christmas decorations, to be pulled out each year. I really like each Christmas card, and wanted to make a craft with them, or else display them somehow. Last year, we made a Christmas card tree in our living room and I hung every card we received into the shape of a tree to enjoy the cards all season long. We’ll likely do this again this year, but I didn’t want our cards hanging in the tree. I decided to keep the cards as they were, and hang them up as a sort of Christmas card banner. I cut some twine and attached the cards to it with mini clothespins. Then, I hung the banner up with some Christmas colored washi tape. Do you do anything with your old Christmas cards? It’s Christmas season, woohoo! Expect mostly, if not all, Christmas-themed posts from here on out through December 25. You’ve been warned. To kick off my holiday posts, I thought I would share a new printable to make your own Advent calendar. As I’ve done previously, instead of filling our advent calendar with candies and other treats, I put one Christmas-related activity for Dan and I to complete each day in the calendar. I used to look around Pinterest to find a printable for this, but I found most activity-based advent calendars were very kid-focused, and not really things Dan and I would want to do, like color Christmas cards or have a picnic by the Christmas tree. Not that there’s anything wrong if you want to do those. As I’ve done a couple times before here and here, I came up with Christmas activities that adults would want to do. You can download the printable PDF here. I did keep some kid activities in there, like watching How the Grinch Stole Christmas and taking silly Christmas photos, but I tried to balance those with the more adult-like activities of a candlelight dinner, a coffee date, and an electronic-free evening. I left one card blank, for you to include your favorite Christmas tradition. One of my favorite activities is listening to the Cinnamon Bear radio show. A co-worker told me about it years ago, and we’ve usually listened to it in the car to and from our Christmas Eve family gathering while in the car. This year, we decided to break the story into smaller parts, and listen to it as it was originally played over the radio in 1937. Each night, we listen to one, less than fifteen minute program. It’s a great way to settle in after a long day. We’ve already listened to a couple of the shows, as it started on November 29. If you decide to do this, just listen to an extra show each night and you’ll catch up in a couple days. You can listen in (for free) each night here. Let me know if I’ve missed any of you favorite activities. I hope you have a wonderful Christmas season! I like using kraft paper as wrapping paper. I find it extremely versatile, and I just can’t resist how it looks with some twine wrapped around it. So simple, yet so pretty. While I was on my kraft paper kick, I asked Dan to buy me a new roll on Amazon. Well, Dan bought a roll so big and so heavy that I can’t even move the roll myself. With so much paper, I knew I needed to think of new ways to use it. I was going to wrap my mom’s birthday gift, so I decided to try my hand at painting the kraft paper, and using that to wrap the gift. I kept it easy for my first try, using only a dollop of craft paint and a pencil in this DIY. Dip the pencil’s eraser into the paint, not getting to much on it. Press the eraser onto the paper. You should be able to get 2-3 dots before you need to go back for more paint. Let the paint completely dry, then go ahead and wrap up your gift. I used twine to finish off the gift, and attached a printed envelope (found here) to the top. I’m really happy with the way the paper turned out. The only downside is that you’ll have to factor drying time in when you want to wrap a gift. I’d suggested making a bunch of painted wrapping paper ahead of time, and then just using it when you need it, to save on time. I’m hoping to try out more ways to punch up kraft paper. I’ll be sure to share when I do. Since November is the unofficial start of the holiday season (don’t worry, my tree isn’t up or lit until the day after Thanksgiving), I always find myself thinking about everything I have in my life, and being so grateful for it. Over the past few years, I’ve found different ways to bring thankfulness to top of mind throughout November. I thought I’d compile those projects for you, so you can have your own Month of Thanks. Back in 2011, I hosted our first Friendsgiving. I placed small paper circles on everyone’s plate, and asked that each person write down one thing for which they are thankful. 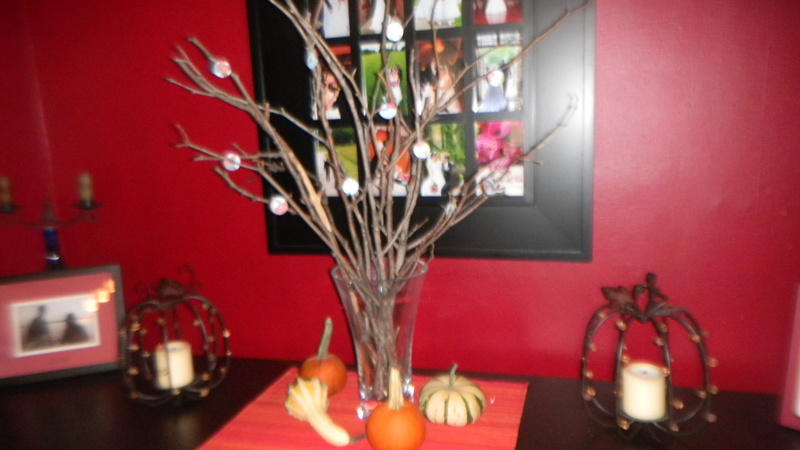 I took those circle and glued them to sticks that I had placed in a vase. I called this the Thankfulness Tree. In 2012, instead of thinking about something I’m thankful for, Dan and I took the month to show our thankfulness for one another. I made Thankful Sticks, which contained one thoughtful thing to do for your spouse each day of November. Last year, I made Thankful Books. They contained 30 pages, and each night, Dan and I wrote down one thing we were thankful for that day. Are you doing anything with your spouse or family to have November be a Month of Thanks? Hit the comments to share. And even cuter – they’re made from onesies! I wanted to get a friend (who was expecting a boy) a little gift, but didn’t want to just put onesies and socks in a gift bag and call it a day. 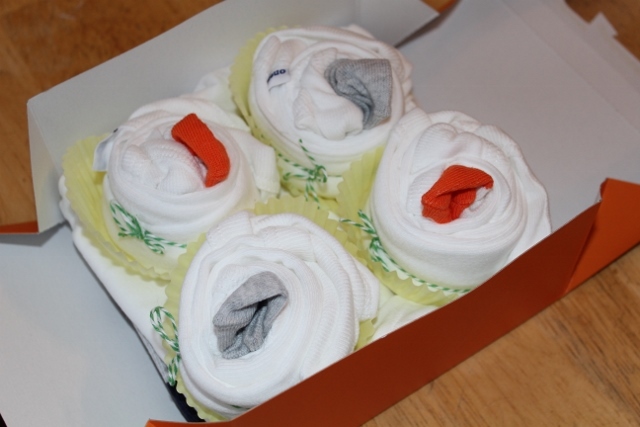 I saw this blog post and thought creating teeny cupcakes from the clothes would be a fun way to wrap the gift. All you do is fold and roll the onesie around a sock, making sure to leave a bit of the toe sticking out to be the cupcake’s cherry on top. I deviated a bit from the blog’s directions by using colored twine to hold the cupcake together and placing each cupcake in a wrapper. The hardest part was finding a cute cupcake box! I found this one at Homegoods, which came in a pack of two. I saw some at Michael’s too, but only in plain white. 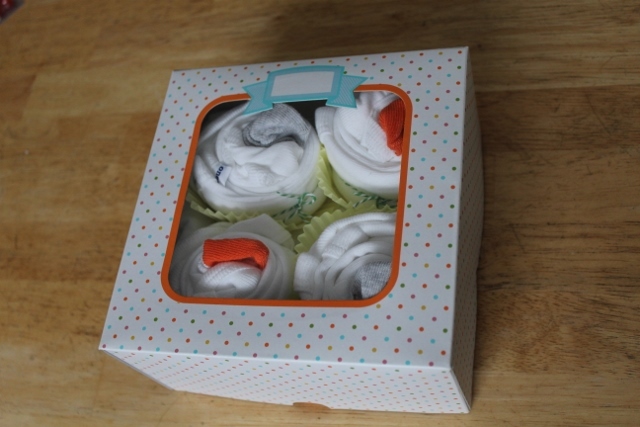 The onesie and socks packs I bought came with more onesies and socks than I needed, so I just folded them and placed them on the bottom of the box, putting the cupcakes on top. I love taking gifts up a notch, and the cupcake presentation certainly did the trick. Do any of you still send snail mail? I do. I even have a pen pal, living half a country away in California. I absolutely love opening the mail box and seeing a fun note or card from her. It’s such a treat! 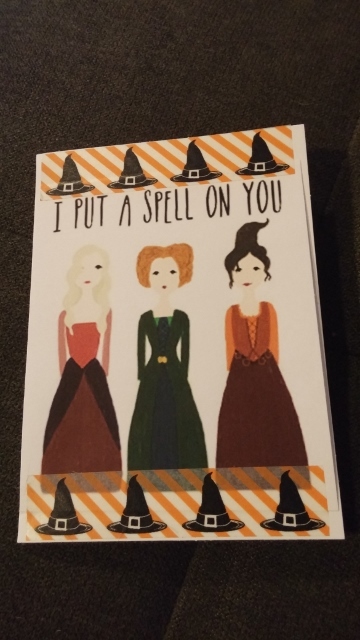 I made her a cute little Halloween card that had a Hocus Pocus theme using a graphic I found online and some witch hat washi tape. 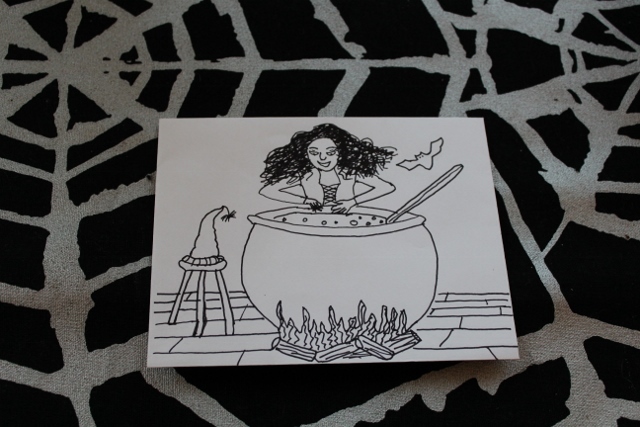 I wanted to keep the envelope as fun as the card inside, so I thought I’d try my hand at drawing a witch on the envelope itself. I thought about it for about two seconds, then remembered that I can’t really draw. Like, at all. But, I can trace with the best of them. That’s when I found this envelope template on Pinterest. The designer meant for you to actually create an envelope by printing the template and folding the paper into an envelope, but I thought it would look better if I traced the image with a marker pen. So, I printed the template, cut it to fit into the envelope, and got to tracing. I love how it turned out. I used my orange Le Pen (seriously the best pens out there) to write in my friend’s name and address. My return address is on the back, so it didn’t take up room on the front of the envelope. I’m going to have up my game on all of my letters now. So fancy. Cut straight to the before photo – nice photobomb, Pheebs. And now the after. After much back and forth, we decided on this retro-looking orange and white print. The fabric came from these curtains from Kohl’s. I ended up scoring them for about $28 and free shipping! They’re thick and were perfect for the job. I know, after looking through all those fabric choices, I ended up choosing patterned curtains. I considered doing a step by step tutorial to show you how to reupholster a chair cushion, but with so many awesome tutorials out there already, some of which I consulted for this project (thanks Pinterest! ), I decided it would be better to link to the tutorial I found the most helpful, which is from DesignSponge. My only changes were that I didn’t add cotton batting between the foam and bunting, and I didn’t add fabric to the bottom of the seat either. As for materials, we were able to recover the wood from each seat, so no extra expense there. Some of the wood was coming apart a bit, so we used wood glue and a vice to push the wood back together. We let the glue dry overnight with the vice attached. Once we took the cushions apart, it became clear we would need to replace the foam padding. Thirty years of sitting in these chairs made the foam thin and turned some of it into a fine dust. I knew foam was expensive, and my fears were confirmed when I saw each yard of foam was $34.99 at JoAnn’s. You can find somewhat cheaper options online, but we wanted the foam quickly, and not have to wait for shipping. We took a ride to JoAnn’s to see if there were other options, and we found these NuFoam pads. They were a little bigger than we needed, but thought there would be less waste in purchasing the individual foam pads (so we wouldn’t be paying for excess foam we wouldn’t be using). Plus, we had a coupon for 25% off our purchase. We did run into an issue – there were only four of those foam pads at the store. Not wanting to go to another Joann’s at 8pm, and, not wanting to pay for a half yard of foam, we got creative and bought two foam seat pads that were a bit smaller than we needed. We used extra foam from the bigger pieces to cover the whole seat. Hey – you do what you have to do! For the batting, since it was 90 inches across, we were able to get by with only 1.5 yards. Batting isn’t super expensive, so if we messed up, it wouldn’t be the worst thing to buy more. Following the tutorial, and having done a similar upholstering job on the built in seating for the kitchen, we started by gluing the foam to the seats, using Liquid Nails. Once dry, we covered the seats in batting, using a staple gun to secure it. I ironed the curtains to get out all the wrinkles, and we laid it out on the ground flat. 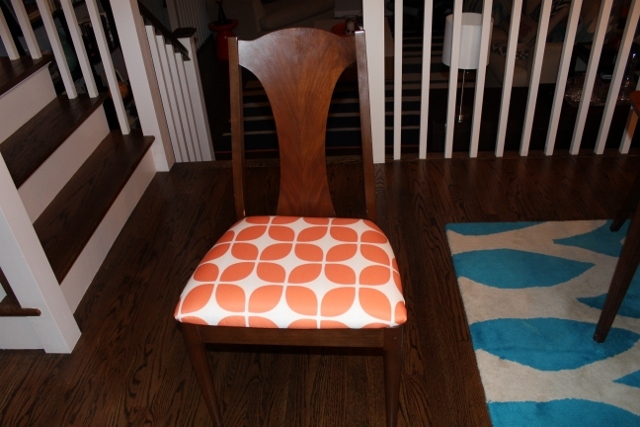 Because our fabric had a pattern, we did our best to make sure it matched up the same on each chair. Then, just cut the fabric into squares (leaving a few inches on each side to attach the fabric to the cushion underneath with staples. Once all the cushions were done, Dan went and sprayed scotch guard on all the seats, just to give the fabric some extra protection against spills and stains. We let them dry in the garage overnight. 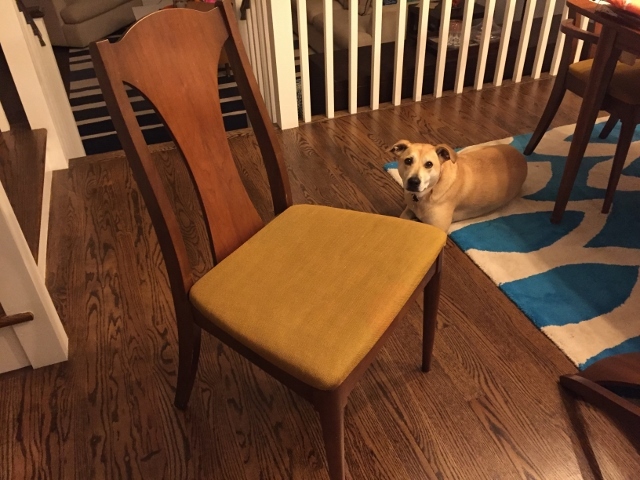 So, the total cost was around $87, or about $14.50 per chair. If we hadn’t had to replace the foam, this project would have been much cheaper, to the tune of less than $6 per chair. We did save a bit on the fabric though. The thick upholstery fabric was at least $20/yard, and I think we would have needed at least 3 yards. Still, the cost was worth it. The dining set has sentimental value to me, it matches the house well, the lines on it are gorgeous, and I loved bringing new lift to 30+ year old furniture. I had planned to show you the mostly finished dining room now, but unfortunately, Daylight Savings Time has been foiling my plan to photograph the room in natural light (the best light to capture room shots). It’s been too dark each night I’ve gotten home from work this week to get good lighting. Frustrating. So, over the weekend, I’ll be sure to take some good photos to show you how the room has come together including big updates, like the reupholstered chairs, and smaller ones, like how I styled the freshly painted credenza.